Greetings, quilt fans! Has it been hot enough for everyone? I think I've been baked, broiled, steamed and fried this summer! I must admit that I prefer the cooler weather--although I do have air conditioning in my quilt room. It keeps me motivated to work! Sad news on the phoebe front: The day after I posted the last pictures all the babies and parents were gone. I found the oldest (largest) baby and gave him/her a proper burial. As for the rest, I have no idea. I have seen the parents around, but not close to the house. That's why the pictures stopped. 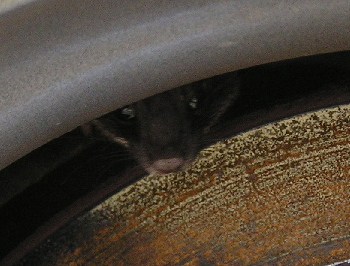 But...I had a weasel in my tire yesterday--not sure why or how, but I did get a couple good pics (see below). 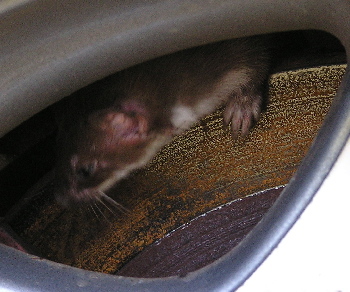 I put the cats indoors, laid a small stick into the rim and to the ground and kept checking. After about an hour he/she was gone. Chattered and didn't seem afraid...but still wild--hands off. 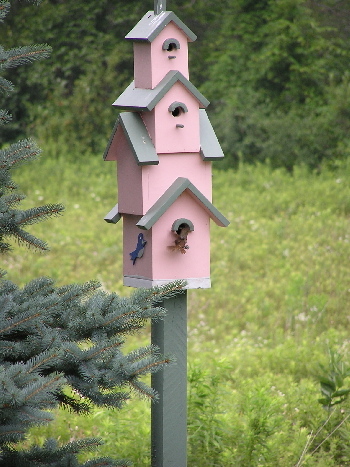 My dad built me "the big house"--a four story bird house that is just delightful. 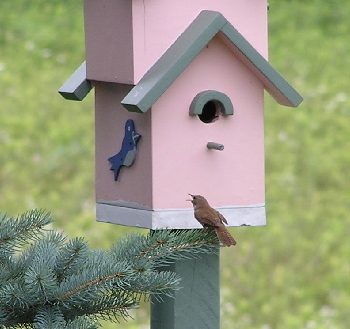 A family of tiny wrens built in the largest "apartment"! They are quite sassy but are fun to watch. There are two pictures of "the big house" and the wrens below. Anita and I just got back from our annual Wiawaka retreat in Lake George. I don't think we've laughed or sung as much in all our lives! We were bursting into song at the least provocation--show tunes, popular--I even did Staying Alive, much to everyone's embarrassment! We had wonderful weather and the projects that resulted from the classes are fabulous. Take a look under the Retreat section of my website. Think about joining us for next year--August 16-20. Anita and I will both have additional information on our websites soon. Have a wonderful end of August and Labor Day Weekend. Be safe, healthy, and happy. Keep quilting!